I naively thought my second pregnancy and labour would mirror that of my first, how wrong was I! Ruby was born at just over 37 weeks, my waters went first, contractions started a few hours later in the early hours and she was born at 10.37am that morning. I went through my second pregnancy gleefully expecting the same to happen, however it did not. From 36 weeks my midwife told me I was fully engaged and that she too expected the baby to come at a similar time to my first. Well 37 weeks came and went, 38 weeks passed us by and by 39 weeks I was so disappointed she wasn’t here yet and I was still not even full term. The one silver lining was starting maternity leave and getting extra weeks to spend with Ruby, one-on-one before the new arrival. 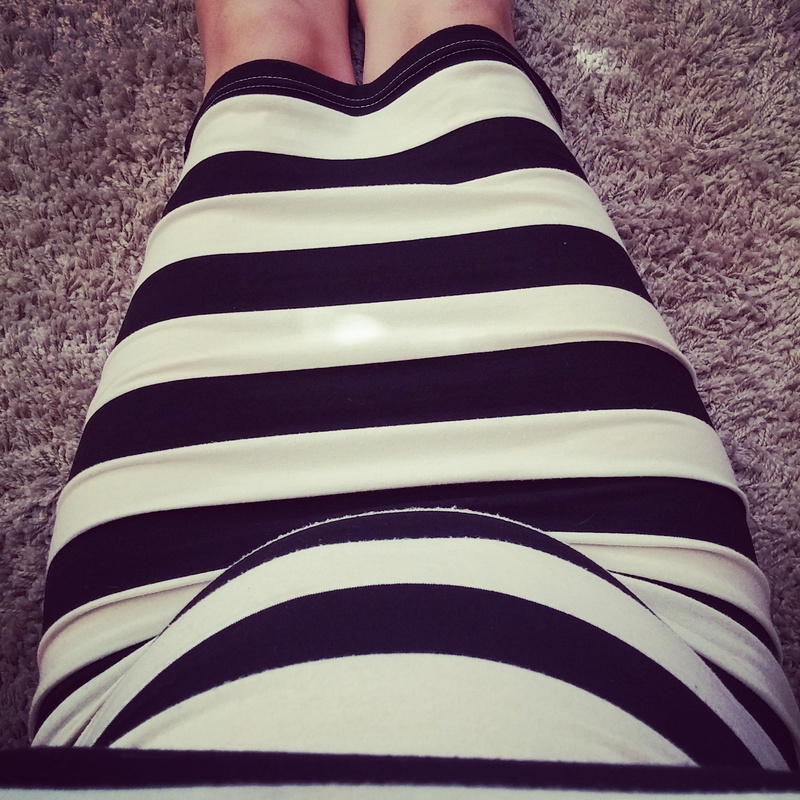 This summer was one of the hottest I can remember and although it was uncomfortable being pregnant, I was glad the baby decided to stay put until it got slightly cooler. 25 weeks down, 15 to go! My bump is finally starting to show now and I am well and truly into my maternity clothes. I have always been pretty small so learning to accept the changes to my body has probably been one of the toughest things so far. I think I am frightened that I will never again fit into my pre-pregnancy clothes. So far I have put on just over a stone and a half and although I am allowing myself a few extra treats here and there I am not eating any more than I usually would be. As soon as I remember what we are getting at the end, the weight gain seems like a small price to pay! 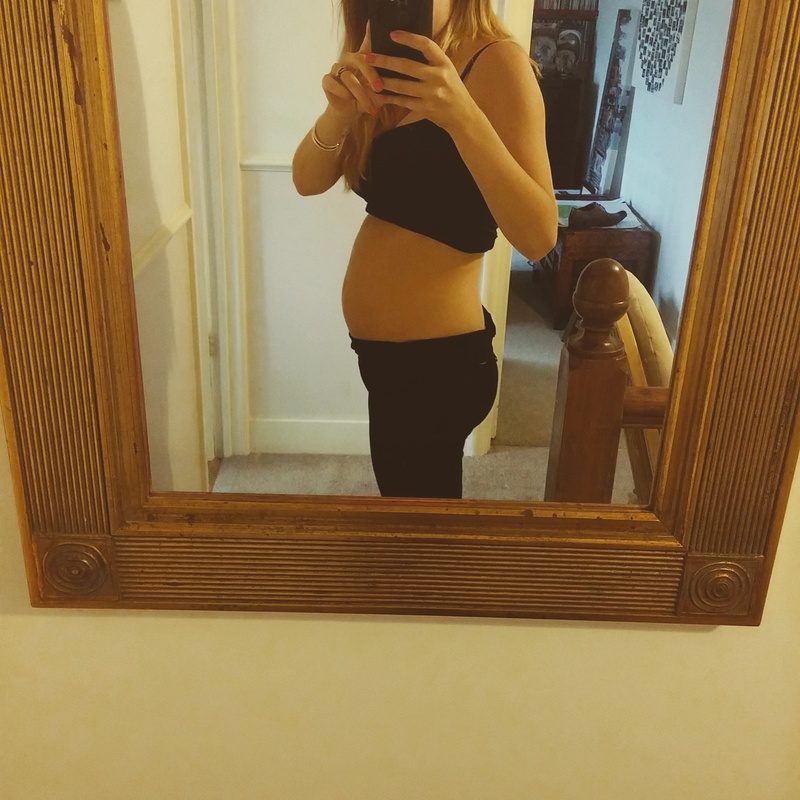 22 weeks – watching my belly move!! After not feeling much up until now, this evening laying in bed I could definitely feel the baby kicking! Chris even managed to feel it kick once which was lovely – he has been waiting to feel this for ages! We could also see the movement and either a foot or hand poke out just below my belly button several times – this was extremely odd and weird for me but strangely exciting too. I still cannot feel the baby move all the time but it was reassuring to have finally felt what I know were actually kicks! I have given in and got online to seek some maternity clothes! I came across ASOS maternity sale which had a huge collection of brand to choose from and the prices were really reasonable. Also, Topshop have a few good bits left in their online sale, I managed to get a maxi dress for £10 which will come in handy next week when we go on our babymoon. Today I had my next midwife appointment at just over 21 weeks. This appointment was not a long one and the usual bits were checked – my blood pressure which was slightly low but not enough to be worried about, my urine which was fine and also the baby’s heartbeat. The baby’s heartbeat was the best bit as you could hear it go up and down which the midwife said was the sign of a very strong heartbeat. We also spoke about me not feeling the baby at the moment but she was not too concerned and told me to have a warm bath or watch for movement in bed – she said as this is my first I may not notice unless I really concentrate as the baby’s movements are still quite hard to feel. Next appointment in 4 weeks – bloods will be taken this time (routine) and I will also get given a growth chart. Second hand items – to buy or not to buy? The cost of preparing for your first child can go into the thousands! There seems to be so many gadgets out and about that you MUST have that it is no wonder parents end up spending a fortune on things that lets face it, they may never use. I think back to what our parents had and what their parents before them had and we all turned out okay – so what do you really need and what is just a bit of a gimmick!? This list seems to be quite good, there is a section for items which are nice to have but but essential as well. We have decided to buy bits and bobs as we go along to try and spread out the cost. Prams were one thing that we found to be crazy prices – some over £1000 once you had purchased all the extras! We went out and tested a few and in the end settled on the Joolz Day Earth which was easy to push, at a good height and folds down to go in the car well. It also means we can use the maxi cozi car seat on this pushchair which will be very handy when the baby is first born. If we purchased the pram new it would still cost us over £1000 so we did a bit of looking around on eBay and Gumtree and saw there were quite a few second hand ones about – some in much better condition that others. The one we went for in the end was from eBay and had only been used a very limited number of times, it came with a whole load of extras and looked immaculate. It cost us less than half the price of buying new and is in perfect condition, it is a little bit of a gamble buying second hand if you cannot go and view but it certainly paid off for us! There are lots of local groups on Facebook and also Gumtree which you could use for second hand items and be able to go and view before purchasing. We also picked up a massive bundle of 0-3 month clothing either new or worn once for £30, there must of been over £200 worth of clothes all brand like Next and Mothercare. The cot is another item we purchased from Facebook locally, it is a John Lewis cot which costs over £100 in the shop and we got it for £25, other than a scratch or two it’s in amazing condition. We will be purchasing the mattress new as that’s advised but cannot fault the cot. It just shows that even though having a baby can be expensive, if you do look around locally, there are some bargains to be had. We are going to go along to the next local NCT Nearly New sale as I have been told these are fab! I’m starting to need some new clothes! Leggings have become a must, literally living in leggings right now, although I did find this stretchy stripy dress still just about fits. In a few weeks I may have to look at getting some clothes for work but so far on my lookout for maternity items, they are still few and far between. And the bump has started to pop out – now I actually look more pregnant than just a bit porky! Finally the tiredness has eased off and I’m feeling more like myself again – it’s only taken 14 weeks and 4 days! I have been doing more exercise as well which I think has helped, not anything too extreme though! We have been out on the bikes and walking to the beach after work as sitting at a desk most of the day probably isn’t doing me much good. I want to try yoga over the next few weeks as I’m really missing my other classes! Also, I have found that by eating little and often I’m feeling much better than when I have eaten larger less frequent meals. Still not wanting to eat much meat though! No scan date yet but meeting with the midwife in 2 weeks so hopefully will get booked in then. Looking forward to seeing how much the baby has grown. One of my friends suggested getting a Doppler at home to be able to listen to the baby’s heartbeat. I was a little sceptical about getting one as I have heard quite a few negative things about them – mainly they cause unnecessary worry for mum-to-be and midwives are not keen on them at all. As it was only £20 from Amazon we decided to give it a go. It comes with headphones and a small tube of jelly as well as the instruction leaflet. We spent about 20 minutes trying to find the heartbeat but had no success! It is possibly a little early yet although I have seen some people comment they have found the heartbeat at 10 weeks. At one point we did think we could hear it but then realised it was just my own!! You can tell the difference as your heart beat is a lot slower than that of a baby at 14 weeks. We may try again in a week or so! We are not worried though as it was only cheap and the hospital equipment probably costs 100 times that in comparison. Right now I would say they are more trouble than they are worth, will let you know if that changes!